I was successful with refilling a “replacement” x31 battery, that was not manufactured by IBM/Lenovo. It is possible that “official” controllers will self destruct if you un-hook them from cells/power. Hi Guys, Iv done a Repack for my Toshiba notebook (Battery pack: PA3479U) and I had the problem of not charging and the pack was not powering the machine at all, because I disconnected the controller board. What I did to “reinitialize” the controller to accept charge and power the machine was to manually discharge the pack to about 3.1v per cell with the controller connected. After doing that the pack started low level charging until the cells were with in spec of the controller to allow fast charge. Now the pack works 100% and I am quite happy with my handy work. Thanks for that tip, hopefully the same procedure will work for other battery controllers from other laptop brands! I have looked at a couple battery suppliers and the 18650 cells all seem to be rated at 3.7 volts now. I know I need three 3.6 volt cells to match my battery pack which has a 10.8 volt output. Will this work if I use 3 x 3.7 volt cells for a 11.1 volt battery output? Is my laptop going to blow up from this 0.3 difference in voltage? I believe your laptop will be fine. Typically electronics allow for at least a 10% variance in the voltage levels. I got a wierd situation here , HELP !! 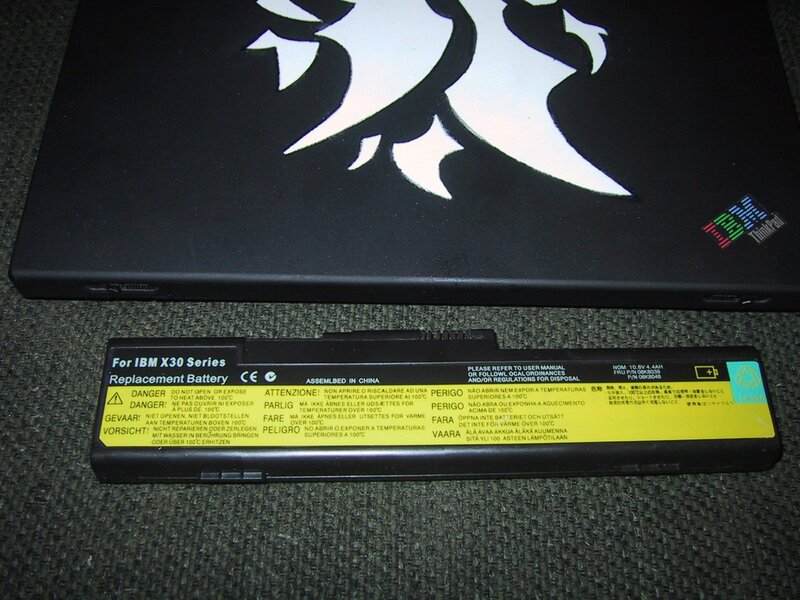 – Just opened the battery (GA-M912M netbook ) : P/N 92BT0020F. – I see 4xCGR18650CG [MH12210] cells (Panasonic) , rated at 2200 (avg). 3.6V. – But the Battery is rated 4500 !!!! So what do I do now ? and how would you suggest I go about dis/connecting the new for the old ? and i forgot … it 7.2V (2×3.6V) 4500mAh . It sounds like they have 2 pairs of 2 cells. Each cell is wired in parallel with another, and then the two pairs are wired in series. This gives 7.2v total (2×3.6) but it also doubles the individual cell capacity (2200×2 = 4400). I expect that the battery is rated at 4500 because the 2200 rated cells actually give 2250mAH each, so 2250×2 = 4500 mAh. As long as you keep the connections exactly the same, you should be able to replace each cell with another 18650 style cell and have everything work. Anyways, I decided to just replace the four cylindrical cells, which are 18650. I’m thinking of putting in 2600mah LG cells. Costs $38 including shipping. My current battery holds about 62% of original capacity, and I’ve done the calculations. If I replace only one string cylindrical cells and all goes well, I’ll still end up with 108% of original design capacity. Would it be worth it? I’m not too worried about only replacing one string because I think they are controlled separately from each other. One more question, to feed the voltage while replacing cells, I’m planning to use a voltage/current generator. Should I use 4.05V as each individual cells currently measure, and replace one cell at a time, or should I provide 16.20V for the entire string and swap the whole string at once? I’m thinking I need to do 4.05V, and replace the individual cell one by one, because they each have wire connection to the circuit board for individual measuring voltage. Another question, what current should I be using? 50mA? By the way, I read those ebay 3000 mah 4000 mah battery are bogus and they are junk. hey,nice i’m planning on building, my battery is a 6cell and i’m having trouble finding the correct size, they are the same colour as the ones in the photos(or look the same) what model number are your replacement batteries? Now i already opened the Battery Case and found that there is some Samsung 2200mah batteries installed. I searched a lot on internet and found that i can get each battery at a cost of $6…… for the same 2200 MAh.. because the HP battery check make report that Battery Capacity = 6600 MAh… so i think that if i’ll go over this 2200 mah capacity i’ll not able to get proper working of the battery…. also guide me that if there is any Flash chip installed in this battery so if there is any i can rather go to buy another 12 cell ultra battery instead of Cell replacemnt..
Kindly update me on my email also.. Even if the electronics think they have 2200 cells, if you substitute 2400 or 2500 or 2600 mAh cells you will probably find that you can make use of the extra capacity (even though the power control electronics may be slightly confused, and report that you are at 0% battery remaining for a half hour or so before the battery is fully used up). Charging it usually regulated by voltage and current draw, so it will charge up the cells fully, even if they are somewhat larger that it is expecting. Unfortunately, I am not familiar with that specific battery, so I do not know if the chip is programed to “die” when/if you remove the cells. The safe thing is to connect the new cells before removing the old cells (so the power electronics never “notice” that the cells were removed). This takes a bit of effort, but is the only way to be 100% sure that the replacement will be successful. How I can connect the new cells before removing old? Do u have any video or information to share? to the power control chip in all the appropriate places. I Live in a city where about 90 % percent poeple purchase usde loptop computers, which usually imported from European countries. there model also used to be out dated , in which the majorproblem comes with batteries, which literally do not provide sufficient back up. I have very much interest in this repairing work, and I want to learn it properly. therefore , I need your kind advice. If I start learning this repairing work, can I do? As I have no experince indeed in this work. And for the purpose what exact tools are required for my workshop? You can do it, but it will take some practice and learning before you get good at it. Also you should know that some batteries are not easily refillable due to their control electronics not accepting new cells. just for the record-I have HP Compaq 610 and the new battery (2600mhz Samsung) works ok for 3.5 Hours !! (original works with 1 hour on full brightness). My problem is that the battery bar show 0% after only 12 minutes! and if I shutdown when batt on 0% the computer do not open again, just until I plugged it again. Maybe when the batt is on 0% the chip on the batt do not let the computer to start. I’ve tried to charge it to 100% and discharge it fully (in linux) so the computer shutdown in a moment with no hibernate, but it didn’t calibrate my batt. 4. restart to win 7 and have about 3 hours of working on 0% with no time bar. It sounds like you have successfully replaced the cells, but the power management chip is not “learning” about the new capacity. When I replaced my cells I had to do full charge/discharge cycles 5-7 times, and my chip gradually learned about the new capacity. If your chip is set up so that it will only allow capacity to go down (and never “grow”) you will never be able to get a good capacity measure on your new battery. Hopefully you will be able to modify power settings in your OS so that the OS does not shut down automatically when the battery (falsely) reports a low reading. but can we increase the number of cells in parallel to give long backup time with same output. the output will be same but the work hour will be increased. I do not bother about the charging time it takes to charge i can give as much as it will, jus i want is long backup so by doing this jus i want to confirm that the battery i am going to use or the laptop will not be damaged. When opening a piece of electronic equipment and soldering extra things to it you always have the chance of damaging it, but unless you hook something up incorrectly I expect that it will work fine. Even if you mess things up, it is more likely that the battery will stop working than you will actually be able to harm your laptop. The biggest problem I see is how you will physically mount the extra cells to the battery so that you can still plug it into your laptop. Your project is very good I would like to use for my netbook s10-2 that after 2 years the battery is almost dead (when i bought it has 15% treadwear). The cells that is build with are samsung icr18650-22f, so I have to choose new 18650 cells with 2.2Ah? My other question is that the cells are not attached to each other and to the controller with wires but with flat metal (i don’t know how to describe it) and the problem is that I want to solder the new cells before removing the old ones (for the memory). Can I use any other simple wire??? You can use any 18650 cells that are 2200 mAh (or greater if you want more capacity). You could possibly even use cells of a smaller mAh rating, but they may be charged slightly too fast and heat up more than is recommended. The only real good way to test cells is to charge them up with a voltage/current controlled power supply, then discharge them to make sure they have full capacity. This takes time and somewhat specialized equipment. In your case, as long as all of the cells have a similar voltage level when they arrive, they are probably good to go. any advice How to know if flash chip is present on battery, would be very helpful. Thanks Jay, It really helps, I will try and let you know, thanks again. Hi, very nice write up. I did this to my Vaio battery, but now it is not detected by my laptop at all. I think the circuit you were talking about is not allowing current from my batteries past it. I know the batteries are charged, I checked them. Thanks. It does sound like perhaps the VIAO battery has a “self destruct” code that keeps it from working after it detects that the original cells have been removed. Thanks Jay. Any way to bypass this? 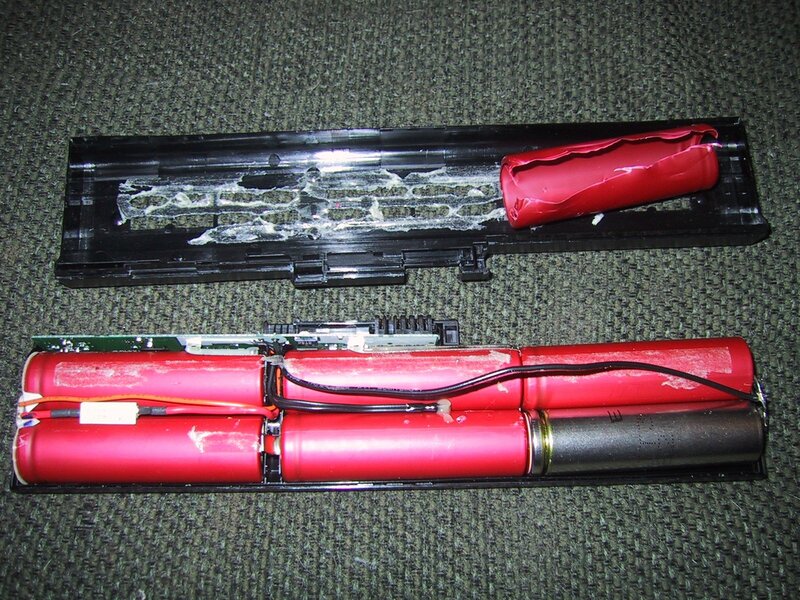 Or did I just waste all that money on new 18650 batteries? You may be able to “reflash” or “reset” the chip, but I wouldn’t know how. You’ll have to do some / a lot of research about the specific battery charging control chip used in the circuit board on those batteries. That isn’t impossible, but unless somebody has already figured it out for that specific battery type, it will take a lot of work to figure out. For others doing cell replacement with your type of battery, it sounds like they should build up the “new” battery pack out of the new cells, then connect the whole thing “in parallel” with the existing (but very old) battery pack of “old” cells, and only then disconnect the old cells. (You’ll want to make sure that the new cells are charged to about the same voltage as the old cells so lots of current doesn’t flow one way or the other. The easiest way would be to charge all cells before connecting.) This way, the monitoring and control chips don’t notice the swapout. What I’ve found so far is that the negative battery side is getting all the way to the main negative pin. The positive side is not allowed to pass to the positive pin. I soldered in a wire directly from the pos. batt. side to the pos. pin and it did actually power my laptop, however my laptop still didn’t detect the battery therefore was unable to charge it. So that wouldn’t work. What I really need to find on this battery is a pin out diagram. No luck so far. This is Ramesh, I need some information from you. I am having HP HDX16 note book since one year without no problem. Usually my computer getting heat in normal use, and when i am working with video editing , it will get more heat, but I never considered that heat because of I checked my processor graph as 99 percent when in editing mode. Recently battery stopped working suddenly, but its showing as 29% available and plugged in charging, but when I removed power card computer getting off. why? My question is what was problem with battery? Why computer is not using remaining 29% power? Gradually decreasing power in the battery to 27,26,25% why its not charging? I like to replace the cells is it possible? It is possible that a thermal cut-off switch inside of your battery has tripped (due to the overheating when video editing). I don’t think that this indicates a problem with your individual cells, so replacing them may not fix the problem. First thing to try is to remove the battery from the laptop, and turn the laptop off, and let them both cool off overnight. Hopefully the thermal switch will re-set (and it’s not a fuse that is blown forever). If it never re-sets, you may need to purchase a new battery. Thanks Jay for this nice tutorial. After reading this I decided to give a try on my laptop’s battery, which has been dead for 3 years. My laptop is Mitac8640M4 model. Which looks very similar to winbook laptops. The battery pack is made of by Panasonic, model CGR-B/T19SE-MSL (14.8V – 6000mAh). There is no battery indicator on task bar, but in power option properties it shows a red cross mark on a battery and 0%. When I remove the battery pack it shows not present. All I want to know is that, is the circuitry still working or not (3+ years not working)? Can I use over 6000mAh cells like 6600mAh or 7500mAh cells or lithium polymer pack? Waiting for your expert opinion. All I want to know is that, is the circuitry still working or not? Can I use over 6000mAh cells like 6600mAh or 7500mAh cells or lithium polymer pack? It sounds like your battery charging circuit is still working (and talking with the laptop) as the display changes from “bad cells in the battery” to “no battery” when you remove it. You should be able to replace the 6AH cells with 6.6 or 7.5AH cells without problems, although charging will take a slightly longer amount of time (but discharging should also last longer as well ;>). If your battery protection circuit is designed to “shut itself down” if the cells are removed, you may want to solder the old cells in parallel with the new cells, before disconnecting the old cells. This way the battery protection circuit may not know that you have made the swap. Thanks for your reply. Once again I need your advice. I’m having hard time finding right kind of battery cells. I was searching the net for 6.6 or 7.5 AH cells. Though I find some but don’t know what would be the right voltage for me. Because there are no voltage sign on the battery cells. So, how to determine what is the right voltage for me. As the battery pack says (14.8V – 6000mAh). I have 12 cells altogether in my battery pack. Just replaced a Thinkpad T400 6-cell battery and it is totally not worth it. Don’t know if it works yet, will plug it in later, but the problem is first, the case now doesn’t shut completely, the front of the batter doesn’t (other side of the connector). Replacing the cells was a nightmare, there was only one short 2-inch wire and everything else was the flexible sheet that is soldered to the battery that wouldn’t come off. I don’t think its worth it, yes if the battery works, I will try to get at least 2 years out of it, will probably use black duck tape to keep the case completely closed. Yes, it is definitely a lot more work/time/value than just buying a replacement battery. If you are good with the assembly you can make everything fit, but unless you know the BMS control board inside allows cell replacement you have no guarantee that it will work until you try it out. I think the either the plastic has changed or the design has changed in such a way that putting them together is a lot harder now. I don’t there was any way of taking the case apart without destroying some of the plastic there is required to snap the case back together. I will find out later today if it works. Looks like the battery is dead, won’t charge at all. I have the Thinkpad T400, I wonder if the battery died when I took the cells off. Well probably did, I know I soldered the batteries correctly, though there are more wires than usual. Any suggesting, besides checking if the wiring is good. Is there to check if the electronics stopped working when I took the batteries off line. If you have a generic replacement battery, the BMS boards are less likely to shut off just because the cells are removed as part of a replacement. Before you give up on it, leave it in your laptop for a few days, rebooting and/or shutting off your laptop for a few hours every day/overnight, it is possible it will reset itself. Glad it’s (mostly) working for you. I suspect that either your laptop’s BIOS or your battery’s BMS board need to re-calibrate itself. If you are lucky, going through a few full charge/discharge cycles will eventually do this. (If you are unlucky, they do not have a re-calibration scheme, and only go in one direction (down) and now can’t understand why your battery is lasting so much longer than it used to.) Try turning your laptop completely off, removing the battery, pressing the power button for a few seconds, and then putting the battery back in to see if that re-sets anything. I had no luck changing the cells in the Thinkpad T400 battery. 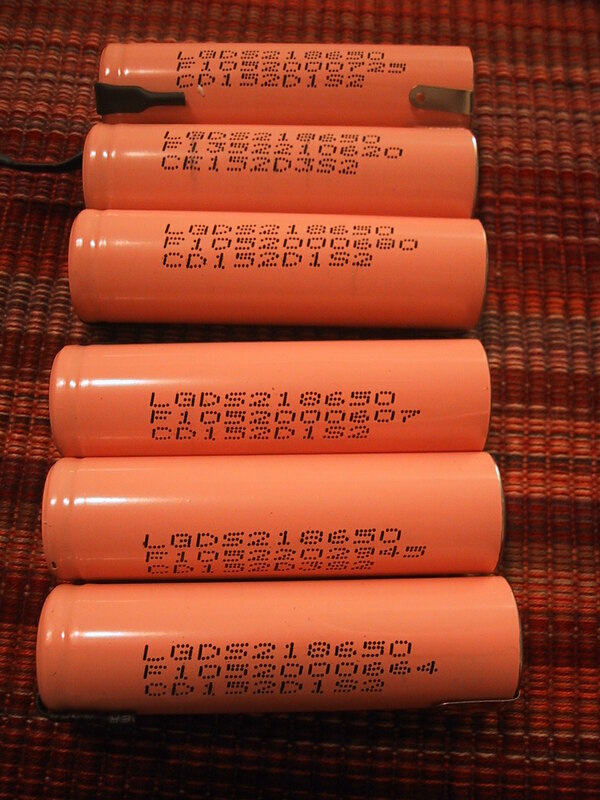 Thus, I have 6 New LG Lithium 18650 Rechargeable Cells (3.7V 2600mAh), never used. Anyone in Chicago is willing to buy them. I received them in June. im trying to make a battery pack for my homemade speakers but i cant find a safety circuit that i could buy so i thought that i could use the circuit in the battery but i cant find the pins that are positive and negative and i still want to be able to charge the battery’s. The battery’s are from a old Sony vaio laptop. Pick the correct voltage for the number of cells you have. For a set of speakers, I don’t expect that the Amperage will be much higher than 500 mA or perhaps 1000 ma (same as 1 amp) if they are really big speakers. If your speakers have a power jack, they may also have a sticker that tells what their current draw is. the battery’s are SANYO li-ion 3.7v with a capacity of 1900 MAH. the thing is that i dont live in the us and i don’t want to order something outside my country and the speaker is just on medium sized speaker wit a small 5W apm that runs on 9-14vDC. so i need to know if i can use the circuit that comes with the battery pack or what would happen if i use the battery’s and charge them without the circuit. You could wire 3 cells in series (11.1 volts) to power your speakers. With only a 5 watt draw, they will never overheat your cells. The only danger is that if you leave them on they will completely drain the cells to 0 volts, which will kill them, but not in a spectacuarly burning way…just a slow death that won’t hurt anything but the cells. As long as you charge them before they get too low they will be fine. The bigger danger is overcharging your cells. If you can find a regulated power supply that puts out exactly 11 or 11.1 volts and never goes higher, that would charge them safely (assuming that 3.7 volts is the correct charging voltage on a per-cell basis, some cells have lower charging voltages and some have higher ( up to 4.2 volts). As long as you are monitoring the voltage levels and remove the batteries when they are changed you can use just about anything to charge them, the harder bit is to find something that won’t overcharge them when left unattended. ok now you seam to know about this stuff so what kind of battery do you recommend i want the battery to be longlasting. do you recommend using the li-ion, a 12V 1,5-2AH lead acid battery or jsut some regular rechargeable AA battery’s. 1900 mAh li-ion batteries are basically 1.9 mAh batteries. Three (or four) of them would be close to equivalent to a “12 volt” battery (which typically ranges from 11-13 volts in actual usage, and higher when being charged. A 5 watt draw at 12 volts is 0.41 amps, which is 25% of the total 2 Ah capacity. The LiIon batteries would actually run this load for longer (closer to 4 hours) than the lead Acid battery (which has a 2 Ah Capacity, but only if discharged over 20 hours….not 4 hours…) They would also weigh less. The advantage of the 12 volt battery is that it won’t burst into flames (as easily) if you overcharge it, and you can find 12 volt lead acid battery chargers all over the place. Regular rechargeable AA’s are typically NiMH chemistry, which is somewhere between Lead Acid and Li-Ion in capacity. AA battery chargers are also dead easy to find. If you are looking for easy to purchase and charge, rechargeable AA batteries are hard to beat. Since you already have LiIon cells, they would make the best choice if you can find a way to charge them safely. ok thank you for everything it was very helpfull! The actual “lifetime” that a battery can drive a load depends upon the AH rating of the battery, and the rate at which you are discharging it, plus the battery chemistry, using something called the Peukert Number which is based upon the chemistry (and sometimes, brand) of the battery. The easy way to get more life is to buy a battery with more AH rating. All things being equal, LiIon is better than NiMH, which is better than Lead Acid in most applications (except for ease of charging). If my laptop is plugged in 95% of the time. How do you setup the battery management to make the battery last the longest? Don’t start charging your battery until it is down to 70% capacity (30% discharged), and only charge it until it reaches 80% capacity. (Most laptops will fully charge the battery, assuming you want as much capacity as possible, so you may need to set things up to “not charge until 70%” and then manually unplug the battery once it reaches 80% to stop charging, then put it back in, or charge it to 100%, and then discharge it manually to 80%. I tried following your advice; by turning the laptop off, removing the battery and than restarting again and putting back the battery but no luck at this time. I can’t understand, power meter shows o time left and my comp continue to work about one hour more, but the flash light continue to blink 4-5 times red and one time green. This does every time I insert the battery in my laptop. Strange ha? I ran into a problem like this with my laptop after refilling the battery. The BMS board didn’t “know” that the cells had been replaced, so assumed that they had the same (reduced) capacity of the old cells. This meant that the BMS board told the laptop’s power meter that the battery was essentially empty (zero on the power meter). BUT, since the cells could continue to provide power for a lot longer, the laptop would run for an extra hour or so…..
For me, my BMS was eventually smart enough to figure out that the cells had “recovered” and it re-set it’s “capacity available” numbers. It did take 5-10 charge cycles. If your BMS is not as smart, it may never reset it’s capacity available number. Is there any possible harm to my computer in relating to what mentioned above? If you run your laptop until the battery is actually empty, the laptop will shut down immediately due to loss of power. If your operating system is in the middle of writing something to disk when this happens, the file system may get corrupted. This could lead to having to run a chkdisk like program, or a completely corrupted hard drive (at very worst case scenario) that would require a re-format and re-install. thanks Jay for you valued advises. I will keep using same battery and see if anything changes. I am wondering if I can replace NI -CD element with LI-Io cells that have PCB for a power tool. Is it safe. Can PCB of each cell protect the battery from overheating? I’m not 100% sure that I understand your question. You should NEVER use a BMS PCB from a LiIon cell on a NiMH cell (or visa versa). However, if you have a LiIon pack of cells that is protected by a BMS system (and it provides the same voltage as a NiMH pack of cells) you should be able to replace the NiMH pack with the LiIon pack. If the pack is wildly undersized, it will overheat and the BMS system should shut it down, either by detecting the excessive current draw, or because the temperature sensor in the cells has triggered. My apologize for a messy question. 2. If want to replace cells to laptop battery, and I am using li-io cells with PCB, do I have to remove the PCB from each cell before I use them and put them in laptop battery pack? 1. Yes, you should be able to do this with no major problems. If the capacity of the battery pack is much greater, you may want to watch out for the motor on the tool overheating if you run it longer than it was designed for. Of course, you will have to use an appropriate LiIon charger, instead of the standard NiMH charger. 2. If you are replacing laptop LiIon cells, you should be able to re-use the existing circuit board. (So of the cells came with their own circuit board you can discard it). Some BMS systems will “die” and refuse to work if you disconnect them from power from a battery, so some people have “hot swapped” cells (soldering in the new cells before disconnecting the old cells). You must be careful that both the new and old cells have the same voltage so they don’t transfer too much current back and forth before the old cells are removed. If you replace your 2200 mAh cells with 3500 mAh cells, you will have a 3500 X 2 = 7000 mAh battery at 10.6 volts. The total capacity of your battery will be 2600 mAh larger. Relating to question 2 that I mentioned earlier, I guess I can’t discard the existing circuit board of the battery but i have to remove the circuit board of each cell? Do I? Hope I got it right? If each of your new/replacement cells has it’s own circuit board then it sounds like they have their own fuse/BMS built in that is different from a “whole battery” BMS that most laptop batteries have (which connects to each cell but has only a single circuit board). Your cells may be specialized or different chemistry from “standard” 18650 liIon cells, so I really can’t give you much advice. In general, when you buy “raw” cells they won’t come with a BMS unless you pay extra for it. Yes Jay, new battery cells have their own fuse/BMS. So I am not sure do we have to remove the protection circuit before using them. China is producing a lot this types of batteries but I am not sure and haven’t tested these kind of batteries. It sounds like they are just fuses that open under excessive heat. I don’t see any problems with leaving them in your circuit. I did some research on the internet where it is stated that: Li-Ion and Li-Poly battery packs should always be used with a protection circuit to prevent the cell from over charging or over dis-charging. Choosing the correct circuit and applying it appropriately is vital to the longevity your batteries and your own safety. And this PCB is incorporated within the battery cell. So I am not sure to remove it or not before using these cells in different battery packs that have their own charging/discharging control circuit. I see nothing wrong with leaving the protection PCB on the end of the cell, IF, and this is a BIG IF….you can still fit the cells inside the laptop battery compartment. However, the protection will be redundant, as the purpose of the laptop battery circuit board is to control charging and discharging current to protect the cells. Redundant protection shouldn’t be a problem (unless the cell protection shuts things down before the laptop battery BMS board does, and tricks the laptop battery BMS into thinking the cell is completely dead when in fact it was just shut down by the protection circuit). The big issue I see is that laptop batteries typically really jam the 18650 cells in, and I don’t think the cells with the protection circuits will fit well. Hello Jay. I have an Asus g73jh (laptop). After 2 years the battery one day died. Opened it, all cells having 0 voltage. They were some unprotected LG 18650, so i bought Panasonic NCR18650A to replace them (these are higher capacity and protected). I did the diy and connected the battery to the laptop. It shows that is charging but 0% charge. Voltage is reporting normally through HWINFO64 (14.48v). Reading through technical documents, i found the pins that you connect to reset it, but with no success. Maybe i just need to connect exactly these pins together without touching any other pins, but it’s too small. Also i found out that the chip can use SHA-1 authorization, which will prevent me running any function if it is activated. Also there is a reset function(software) but i don’t know if it has to do anything with the hardware function:/ I’m thinking of trying to charge cells manually individually but i have no charger, plus now the tabs are welded together. I’m stuck now, i don’t know what to do. These cells were not cheap either..Any help is appreciated. I can post pictures too. It sounds like you have done much of what you can to try and re-set the BMS chip. I’m afraid I don’t have any specific advice to offer on that front. How do you know it is not charging? Perhaps it is charging, but the BMS is not delivering power to the laptop? Typically when you purchase LiIon cells they come with at least a 1/2 charge from the factory. You can use a multimeter to check the voltage level of each cell (and all cells in series). If you have a current regulated bench power supply, you can use it to charge single cells (or the entire series of cells) if set to the appropriate voltage and a low current (e.g. 0.1 amp).